The elegant and dramatic peaks of the Dolomites, one of the most recently designated UNESCO World Heritage Sites, have long epitomised the ideals of climbers the world over. These spectacular limestone and dolomite monoliths rise abruptly from beautiful meadows, their pale faces contrasting starkly with the vibrant colour of the surrounding alpine pastures, to create one of the most instantly recognisable landscapes in the World. Located in northern Italy, and representing a true mix of Italian and Austrian culture, these so-called 'Pale Alps' contain climbing of every shape and size. Single pitch sport crags lie beside kilometre-long traditional routes, with climbs which are steeped in history running parallel to modern bolted lines. The area is particularly renowned for its via ferrata, cabled routes predating the Great War which give superb access to some of the World's most striking summits. The metal wires, interspersed with breathtaking ladders and unlikely suspension bridges, provide aerial assault courses which combine the thrill of an ascent on rock with the security of a protected mountain scramble. 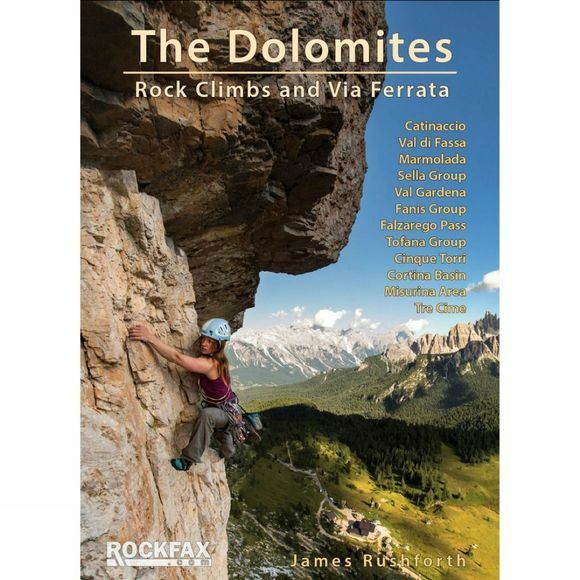 This Rockfax guide covers everything you need for a climbing trip regardless of ability, whether it be sport, trad, via ferrata or a combination of all three. It features all the major areas and is the only guidebook available to have such comprehensive coverage.